At the time there was a lot of advertisement in the US for a fried chicken company that offered 'Kentucky Fried Chicken' and Vishakha countered with this recipe by Yamuna Devi. Not only do you get the same protein and nutrition, but you also get a lovely zesty flavor with your vegetarian version of a commercial meal. If you're creative, you can quite easily give up a meat-based diet without having cravings for things you used to eat when they're advertised on TV. Because the recipe calls for dried chickpeas rather than canned, and also makes allowances for having a pressure cooker, please look over the instructions and cooking times carefully. For example, the total cook time for standard method is 2 to 3 hours, plus the over-night soak, but using a pressure cooker the time is only 30 to 40 minutes. 1. 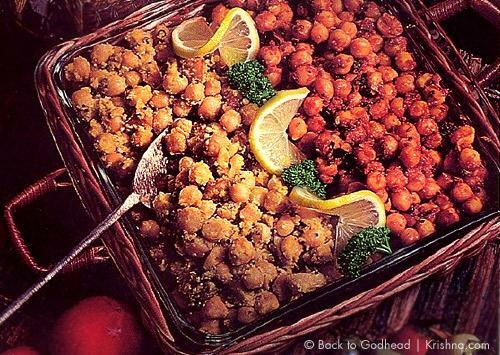 Place the chickpeas in a 1-quart bowl, pour in 3 ½ cups of water, and soak overnight (about 8 hours) at room temperature. 2. Drain the soaked chickpeas in a colander, place them in a heavy 3- to 4-quart saucepan, add 4 to 5 cups water and a dab of ghee or vegetable oil, and bring to a full boil over a high flame. Reduce the flame to medium low, cover with a tight-fitting lid, and gently boil for 2 to 3 hours, or until the chickpeas are butter-soft but not broken down. If you're using a pressure cooker, combine the same ingredients in the cooker but use only 3 ½ cups of water. Cover and cook under pressure for 30 to 35 minutes. 3. Remove from the flame (reduce pressure if necessary), uncover, and stir. 4. Over a medium to medium-high flame, heat 3 ½ tablespoons of ghee or vegetable oil in a heavy 3-quart saucepan for 30 to 60 seconds. Stir in the minced ginger, seeded green chilies, cumin seeds, and black mustard seeds, and fry for about 30 to 45 seconds, or until the cumin seeds turn golden brown. 5. Drop in the curry leaves and, 1 or 2 seconds later, stir in the diced tomatoes. Add the turmeric powder, half the minced fresh herbs, chat masala, and garam masala. Stir-fry over a medium flame for 3 to 5 minutes, sprinkling in water when necessary, until the ghee or oil separates from the sauce and the texture is smooth and even. 6. Use a slotted spoon to add the chickpeas, and then transfer to the saucepan 2 to 3 tablespoons of the water in which you cooked the chickpeas. Reduce the flame to low, cover, and gently simmer for about 10 minutes, stirring occasionally and, if necessary, adding small quantities of the cooking water to keep the mixture from sticking to the saucepan. 7. Remove from the flame and add the salt, 1 ½ tablespoons of butter or ghee, and the remaining fresh herbs. Before offering to Krishna, garnish each portion with a wedge or twist of lemon or lime.